A view from the cycle path: Zeeland - getting it wrong in the "year of the bike"
Zeeland - getting it wrong in the "year of the bike"
Zeeland, the most south west province of the Netherlands which shares a border with Belgium, has declared 2010 to be "the year of the bike." The idea is promote more cycle usage in the province. However, that's not all they're doing. 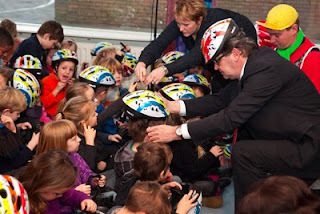 Sadly the good stuff is rather overshadowed by Zeeland having decided to promote the use of bicycle helmets amongst school children, starting in one area with the intention of spreading across the province if they are "successful". That's pretty much a first for this country. So, what's wrong with it ? Well, there has yet to be a helmet campaign which has been accompanied by a rise in cycle usage. In Australia, huge falls were seen. Zeeland ought to take note of what happened in New Zealand, which was named after the province. I grew up in New Zealand, returning to the UK at the age of 15. As children we always cycled to school. However, now ? The website for my old secondary school doesn't mention cycling at all. Rather, there is now a bus route promoted for the 4 km trip that I used to make by bike. Is this the future that Zeeland wants to see ? English speaking countries don't provide any good examples. I watched cycle sheds being torn down at the secondary school near where we lived in the UK a few years back. Dutch secondary schools have lots of cycle parking at present because they need it. Do we want to see this go away altogether as it has in countries where cycle helmets have been promoted and cycling has not been supported ? Also, consider how children use bicycles in the Netherlands. If someone turns up at a friend's house without a bike and an outing is planned, they borrow someone else's bike, or ride on the back of a friend's bike. No-one thinks of this as dangerous. However, if it becomes the norm that a helmet is required, neither of these options will work if just one child is without a bike helmet, so none will travel by bike. Perhaps Mum will helpfully suggest she can give them a lift in a car ? That's how it is in other countries - ones where very few people cycle. Inconvenience is a large part of the problem with requiring people to have special equipment in order to cycle. The same problem as Mike Rubbo pointed out makes bike share impractical in Australia. Just imagine if you could only walk somewhere if you took along some special piece of personalized equipment. Say expensively custom fitted walking boots, and if there was a campaign to say that without fitted walking boots, walking was dangerous. If you cycled to a friend's house, with your normal comfortable cycling shoes, and they suggested that you go for a walk you'd not be able to take part. What's more, this type of cycle promotion plants a seed of an idea. The idea being that here in the world's safest cycling country, cyclists are not actually safe at all. Perhaps this suggests that it's best not to cycle. Cycling relies on a high degree of subjective safety. Without this, cycling declines. Zeeland is also the province where the fuss arose last year about considering implementing a speed limit on cycle paths. Apparently, Belgian cycle racers who come across the border to ride on Zeeuwse cycle paths are a nuisance. However, the only reason these cyclists come across the border is because conditions are better for them in Zeeland than on the roads in their own country. I found the story on ligfiets.net. The same principle works for cars, of course. Imagine a law that forbade you to transport someone in your car without their individual car seat. Such a law could make it inconvenient to transport people in cars, thus promoting other modes of transport. Nooooooo! Zeeland, don't let this happen! I see the point of your article, it does seem like helmets should be extremely low, or non-existent, on the list of priorities of the campaign, since cycling in Zeeland is probably safer than walking or driving a car. But you lost me around the 4th paragraph. Did the experience in New Zealand (and most of the rest of the industrial nations at that time) of a drop in bicycle usage stem from some kind of helmet campaign? Bicycle usage has also been dropping off precipitously in China for the last 20 years, but it has little or nothing to do with helmets as far as I know. And your points about helmets being "specialized equipment" or like expensive boots are hyperbole: a few clicks of the mouse will get you a cheap helmet that fits and meets safety standards. People manage spontaneous buddy rides on motorcycles all the time with various methods. Those aren't valid barriers of helmet to cycling. You can spend much more money on a helmet if you like of course, but the same is true for most cycling equipment (the Mango I really want doesn't seem cheap to me, for example). You're right about the sorry state of cycling to school. The "Safe routes" campaigns here in the U.S. are a tiny step in the right direction. Still, there are many schools now that will send children home if they try to ride their bicycle to school. And that's awful, whatever the cause. Subjective safety and infrastructure, those are the priorities, for which helmets are no substitute. Helmet debate could come later, but only if anyone is still left riding. As an Australian, a Medical Professional (an Anaesthetist) and a cyclist it worries me to see THE cycling country heading down this path. It is a slippery slope and I hope the Dutch fight this. As a child growing up in the 70s I used to ride to school with my friends and ride to their houses after school. The school bicycle racks were overflowing. We used to cycle all around our neighbourhood streets in fact. Since the introduction of compulsory helmet legislation here, cycling rates have plummeted as you say, and you'd be hard pressed to find any bicycles at most schools here. A sad state. I cycle as much as I can in Brisbane on my dutch-built Gazelle (we can buy them here finally - hooray!) as a means of transport and I love it. I also refuse to wear a helmet as there is scant evidence that they do much at all. I am aware that I'm breaking the law but I feel that I need to make a stand. That is my choice. Interestingly, apart from the occasional clown that yells at me (very rare), most cars seem to pass me more slowly and giving me more room. I also am less of a perceived threat to pedestrians and they can see me more clearly - I'm not hunched over behind a helmet & large racing glasses. The most important thing I can see for encouraging cycling is improving subjective safety, as you regularly point out - something which is very important. We have more and more good quality cycle paths appearing every day here which is encouraging. It is also nice to have a proper utilitarian bicycle here to ride, as opposed to the usual fare of road racers and mountain bikes which, while they serve their purposes, are absolutely useless as city transport and they certainly don't encourage normal people to get on a bicycle. Having said that, I'm very keen to visit your Velomobile factory in Groningen as I've been drooling over that Mango of yours! JRA: The drop in cycling happened concurrent with the introduction of mandatory, all ages, helmet laws in New Zealand and Australia. In China the drop was the result of the direct government discouragement of cycling and promotion of a "modern" car owning culture for economic and "national prestige" reasons. John Allen was actually brought to China as a consultant on the "bike problem" not realizing until he got there that they considered the "bike problem" the fact that there were still people riding bikes. He declined to advise and went home. It might also be noted that children are the one class of rider for which it has been proven that helmets can present a fatal safety hazard (they both fail to wear them properly and fail to remove them properly). They should not be used except under direct adult supervision at all times to insure proper and safe use. Good bye independent mobility; and might as well just take the car. That is very, very concerning that Zeeland is promoting helmets. Are the cycle groups able to combat this misguided approach of fearmongering. It concerns me in the UK that London appears to have excessive helmet usage - must be greater than 50%. And even though towns may only be 25-30% it does seem to be going up. This is a sad state of affairs. So, do you know who is behind this, do you know wether the Fietsersbond, the VVV and the ANWB know about these bozos and do you know how we can protest this? I'm so angry I can't see straight,nor think straight. To give these things to schoolchildren, who probably think them 'cool' (for two days) because they saw them on American tv shows and on Belgian tour riders (but who won't find them so cool if they have to wear them all the time)... It's insidious, like handing out bibles or korans in a secular school. I've checked the website of the ANWB. *They* are promoting helmets now as well! Whose idea is this?!!! "English speaking countries don't provide any good examples." I'll give a good example from right here in Ontario. A public school just opened as a "walking only" school. The Halton District School Board will open one of its newest schools, P.L. Robertson Public School in Milton, on January 4, 2010 as a “walking-only” school. As the newly-built school gets ready to receive students, the school board and community partners have been busy ensuring the infrastructure and supports are in place for students to use active transportation to get to and from school. School administrators are enthusiastic about making the school as car free as possible. “We need to have students arrive by foot, bike or any other form of active transportation all year long,” says Joyce Jermyn, Vice-principal at P.L. Robertson Public School. What dreadful news. Recently children here in the UK have been stopped by police on their way to school and advised to wear hi-vis clothing. Is all this part of a plot to stop cycling? The message seems to be get in your tin box dressed as you like but dare to venture out on a bike you need to be dressed like a christmas tree and wear helmets. Marion, please note that the ANWB, though in name a cyclist group, is in fact a drivers organisation. First Denmark, now the Netherlands. The culture of fear is spreading. After all we can't have children growing up being happy and having freedom can we? They have to be kept inside, by their terrified parents, so they can sit in front of the TV eating crap and learning how be be good little consumers, so that by the time they are adults they are too fat to move and all they are capable of is more consumption. Call me cynical, but it appears to be exactly what has happened in Australia, the US and UK. We had an email this morning at work inviting us to join the cycle-to-work scheme run by Halfords. This government initiative is supposed to encourage commuter cycling, but if you read some of their their promotional literature you could be forgiven for thinking otherwise. Every photograph shows a cyclist wearing a helmet and without a trace of irony they state "although it is not a legal requirement to wear a helmet it is common sense to do so". ie you are a fool not to wear one. Although they don't appear to provide any data to back up this "common sense". The culture of fear (especially vague and unquantifiable fear) is used to up the profits of big business. So focussed on making a quick buck that they don't seem to realize that they are alienating potential customers, but then the profit margins are much greater on helmets than bikes... and don't forget all those hi-viz vests, expensive luminous jackets and a myriad of lights designed to light up your bike like a Christmas tree. But Anneke, the ANWB is a *Dutch* drivers organisation. What have they to gain by promoting bikehelmets? I refuse to see any drivers organisation in this country with black-rimmed eyes, rubbing their hands and twirling their moustaches, going "muwaahhahah! Our plan comes together! First the helmets, then nobody will want to ride a cursed bicycle and then! Victory! We will have four-lane motorways all across the country! Muhaahahahahh!" I mean, seriously! What does the ANWB stand to gain? I could understand such from any American or British drivers organisation; they see bicycles as nuisances infringing on their turf, but the ANWB?! *shakes head* This sounds more like overeager 'showing the world how much we are concerned about safety' wanna-be-best-in-class stupidity to me than evil intent. There was a lot of ice on the road this morning and this bike path in Lelystad wasn't clean enough. Knee and elbow pads would have been more useful than helmets. @Marion & @Anneke: Marion is right, it's stupidity (which is all-persuasive). First, the Zeeland province officials started pushing this idea well over 2 years ago to become the 'safest province' in NL. As far as I can remember from researching that whole thing, there's a European connection to this 'competition' in the form of subsidy. The province looked at potential commercial partners to give their approach to bicycle safety 'some body' and voila, helmet manufacturers were eager to jump on board. These officials see no harm in this, because a) they are politicians (opportunistic), not bicycle safety experts, and b) they'd seen pictures of kids cycling with helmets in other countries (UK, US, AUS), so as it often goes (people are sheep) they figured it was proof that helmets make sense and will automatically boost their cause and help the 'image' aka marketing of their campaign more 'substantial' aka visible. Now, the ANWB is clearly not a representative of cyclists anymore, that was settled way back in the 70's with the first establishment of what is now the Fietsersbond/Cyclists Union. The only reason the ANWB is not actively pushing for helmet legislation (big difference with promotion) is that it's choosing its battles...all concerning cars. Their helmet endorsement is very 'ugh', sure, but highly insignificant. When it comes to national/regional/local cycling policies the ANWB doesn't have a seat at the table of the Ministry of Transportation. The parties that do (including MoT) know their data and will never push for either promotion or legislation. Zeeland is of course free to do what it wants. I detest it, as well, but I think (and I'm not naive) this will die a slow death. It will be interesting to see the way this will unfold. I see you point David. We should encourage people to ride bikes regularly and wear helmets voluntarily. I am familiar with the "helmet wars" going on among cyclists -- my point of view simply is that I make my living with a well functioning head, so I wear one most of the times. It has protected me more than once and I know others who have similar experiences. I would not want to try out on my own head wether not wearing a helmet would have caused no more harm. With you, I oppose mandatory usage. I find it interesting that since helmets have become a religion here in the US in the last 10 years or so, nearly every cyclist I know says, "a helmet has saved me a number of times". Also, just about everyone (cyclist or not) seems to know a dozen people who were either saved by a helmet or died without one. In all my decades of cycling all over the country and other countries before the helmet religion I never heard anyone say anything like this. Never. Not a single person I ever met knew of anyone seriously hurt on a bicycle. What has changed in the last 10 years? Why does there suddenly seem to be cyclists crashing all over the place? From an Australian perspective, mandatory helmet laws have been very damaging to cycling in general. See www.cyclehelmets.org for some good evidence that suggests wearing helmets isn't all that intelligent. I also have some anecdotal stories of people falling off their bikes, with helmets, that would have 'saved their head'. The most recent one was just the other day where a friend foolishy clipped my rear wheel and when down. I did not fall off my bike. I have a Dutch Gazelle and sit nice and upright with normal shoes on normal pedals with normal clothes. She was wearing lycra from head to toe, a helmet, gloves & shoes clipped to the pedals. When she fell, I stopped and just stepped off my bike. Her story was very different. As she was on a typical racing/road bicycle with cleats, as soon as she lost her balance she was unable to release her shoes to regain control and fell sideways onto bitumen (we were on a cycle path well away from the street). The way she fell meant that her right arm & shoulder took the brunt of the impact (which barely scratched her) and she was holding her head off the ground. We were travelling at about 15 km/h. UNFORTUNATELY, she was wearing a helmet and, as a result of her head being a good 5 centimetres wider because of it, she actually connected with the ground, which then sent a big shockwave all through her head. The foam cracked but the helmet was otherwise visibly OK. She ended up with a nasty headache but was otherwise fine. I watched this unfold behind me and thought to myself that if she wasn't wearing a helmet, she wouldn't have hit her head in the first place (and of course she believed it saved her)!! Also, this infestation of 'racing' bicycles here (and mountain bikes) for city cycling with the shoes locked into the pedals is just crazy. She fell just like all the people in the video that Frits B posted here, but as her shoes were locked to the bicycle and her head was much bigger than normal, she ended up injuring herself. I think helmets (and some of this other cycling gear) actually increase the risk that your head will hit something! I am an Australian Doctor (an Anaesthetist) and I refuse to cycle with a helmet despite breaking the law. I think for certain types of cycling they may be useful but mandatory laws for helmet use should be scrapped. The last time I fell off my bike was 25 years ago. If I were to change my medical practice based on anecdotal reports of some weird treatment working despite NO GOOD EVIDENCE then I would be deregistered fairly quickly! "I would not want to try out on my own head wether not wearing a helmet would have caused no more harm." On the other hand as I make my living with a well functioning head I have considered it nearly mandatory that I do so. I can also use that well functioning head to understand basic principles and compose them into theoretical structures and test those theories against further try outs. I'll suggest this to think about though, what is it that causes you to adopt that strategy so disproportionately to CYCLING? I'll suggest that it isn't because you are using your well functioning head to investigate the matter, but rather that your otherwise well functioning head has been infected with certain memes. didrik: "Not a single person I ever met knew of anyone seriously hurt on a bicycle." 35 years ago I lost a friend. He was hit by a drunk in a pickup truck going an estimated 90 mph. The impact was so severe that it removed an arm and a leg; yet he managed to live for three days before eventually dying from internal blood loss. If only he'd been wearing a helmet. Not to be misunderstood here. I am no missionary on helmets and think it should be people's choice to wear or not to wear. Personally, I having been riding my bike to school for all of my student life and never wore a helmet because they weren't any at the time. Did fall but never fell on my head severely. However, today I wear a helmet just in case. And have been protected by it on MTB trails and serious falls, have a sister that crashed on her MTB, broke her shoulder and cracked the helmet but her head was fine. To me, this is sufficient evidence and it is hard to convince me otherwise because of the many incidences where people don't get hurt seriously without one. Good for them. I depend on the functioning of my brain so I chose to wear one. Don't want to teach anyone on this. On the adverse effect of helmet laws on cycling I have some doubt. There are helmet laws now in many European countries for scooters and I don't get the impression that their numbers have been crunching. Josef: Each and every one of us depends on the functioning of our brains. Cycling is a special case. There are many positives associated with cycling, especially in terms of overall health effects. The danger of a head injury is absolutely miniscule by comparison with the benefits. didrik made a very good point by pointing out how so many people now claim to have been saved by cycle helmets, even though the injury rate to cyclists never was very high, and still isn't very high. The same societal benefits are not seen with motorbikes. It doesn't really matter if helmets, or anything else, prevent people from motor-cycling. A lot fewer people ride motorbikes and scooters than ride bicycles, at least here. "Not to be misunderstood here." For what it is worth I did not misunderstand you. "To me, this is sufficient evidence . . ."
But to me it is evidence that her helmet was faulty. Cracking is one of the two common failure modes of helmets. It may have saved her from a having a minor "boo boo", but certainly not from any brain threatening injury. I'll also point out something most people don't understand. Helmets of the road certified sort do not prevent concussion; because they are not designed to do so. The protection against brain damage they provide (when they actually work) is not linear. They do not even begin to operate to protect the brain until the impact forces are already sufficiently large to cause concussion. Therefore if you hit your head while wearing a helmet and do not suffer a concussion, it is evidence that the impact was simply not severe enough to cause concussion without a helmet. Faulty interpretation of the evidence is why it sometimes seems to me that there are more people who were "saved" by their helmets annually than died in total, from all causes, in the entire history of cycling before helmet use began to be common. Faulty interpretation of the evidence is why people think they need helmets so badly in the first place as well. If there were universal helmet use in the Netherlands it would have the POTENTIAL to save lives per annum on the order of - several. Not thousands; that would be at least an order of magnitude larger than the TOTAL number of accidental deaths by ANY cause. Just several. In the Tour de France between the late 20s and early 90s while there were any number of broken collar bones and noses, there were exactly NO accidental injury deaths. Cycling, even competitive cycling, is empirically not very dangerous. For the most part it hardly even rises to the level of "risky" (although riding fast off road can accomplish that). The forces involved are small. The body's ability to withstand those forces sufficient. The chances that it will have to are tiny. Why is it that you think of and take Pascal's Wager with CYCLING when it is almost certain that you engage in much riskier behaviors throughout the day without giving it much thought at all? There is little point in taking extra care to make sure your shoelaces are well secured if you are about to take a walk out into a thunderstorm waving a lightning rod around. What causes you to do that? To add some numbers to kfg's analysis, take a look at how few deaths there have been during the tour de france. It's probably the most extreme cycling event anywhere, but just four riders have died during it. One of the four died on a rest day, making rest days (which make up just two days out of three weeks) statistically more dangerous than riding days. It's difficult to see how any of the four deaths could have been prevented by helmets. Just take a look at the causes of death. On the other hand, during the Tour de France a total of 27 non riders (officials, spectators, camera men) have died, mostly due to the dangers of the cars accompanying the riders. Professional racing cyclists are very much at the extreme end of cycling. While they are very skilled they still crash quite frequently because taking risks is a part of getting ahead of others. When they crash they tend to do so at quite considerable speeds. When motorists are also mandated to wear helmets, then I might support a law for mandatory helmet use by cyclists. I wear one, and doing so has has helped me a couple times. But I prefer it to be my choice. I'd welcome mandatory proficiency exams here in the U.S. which I think would be far more successful preventing injury. I believe cracking is the way most helmets distribute energy from the impact, so the helmet did not fail, it succeeded. David, thanks for the blogging. I like the Mango but won't you roast in warmer weather? Do you plan to switch vehicles? "To add some numbers . . ."; 1935. Damn, missed it by that much. Let this be a safety lesson for you kids, even when you're being deliberately a bit vague it might be wise to cross check your references. "One of the four died on a rest day"
Remember kids, when you aren't riding your bike be sure to wear an aqualung. If it saves just one life it's worth it. Sorry, couldn't resist the extra dollop of sarcastic cynicism there. Dr. Paul Martin made an excellent point. I've seen people riding racebikes (rare in the Dutch urban landscape, but there) and always wondered why anyone would want to fix their feet to a lightweight speeding machine. One slip, one wobble and down you go. I, on my solid Batavus citybike can adjust easily. Which brings me to the point of solidity, weight and point of gravity. Mike Rubbo's quest to convert the Australian rider to 'sit-up bikes' is fired by the idea that sit-up bikes are 'friendlier', less 'speed-fiend' and as such drivers might treat them as human beings instead of faceless intruders of their space (correct me if I'm wrong, Mike), but I wonder if the kind of bikes Australians and Americans prefer aren't also to blame for their fear of falling on their heads. I've noticed how, in web discussions about Dutch bikes, always seem to be obsessed by the weight of the bike in question. Dutch bikes are heavy, it's true, but a very smooth ride (with lots of momentum) and very, very balanced. This because the point of gravity is very low and the sit-up-and-beg posture means that the weight of the rider is behind the handlebar. It's bloody difficult to fall off these bikes, but if we do, we fall sideways. The only way we ever could fall on the top of our heads is if we got his by a speeding car, and no helmet in the world could protect me from the damage a car could do. I've found out that in the US bikers have stripped the bicycle down until its a very light frame with very light wheels. This means that the point of gravity lies very high, at the point of the rider, whose weight is positioned over his handlebar. What happens when a bike like that hits a curb? The rider gets flung over the handlebar. Well, that's what I think happens... so tell me please, am I right? Are American (and Australian) bikes really lightweight flimsies with high point of gravity that might flip end over end at the drop of a hat? Marion: There's nothing unstable about racing bicycles, and really nothing at all wrong with clip-in pedals. I use them myself, on some bikes. I'm afraid you're falling into the trap of thinking that racing type bicycles are an alternative to sit-up bicycles. They are not. The alternative to the sit-up bicycle is the car. Australians overwhelmingly drive cars to take their children to school, collect shopping, do their commutes. Racing bicycles are a minority interest in both countries. However, they're a much bigger interest here in the Netherlands than they are in Australia. You can see the evidence for this in bicycle sales figures, but also in the results of professional cycle racing. The Netherlands has been wildly more successful than Australia. Conditions in countries like Australia are good enough only to attract the least risk averse section of the population to cycling. These are also the people more likely to be attracted to racing style bikes, which is enough to skew the market so that these are the only bikes available. One of Mike's videos shows that Australians will go on mass events on closed roads, but won't cycle to work because of their perfectly reasonable fear of traffic. Until you have the infrastructure you don't get the cycling rate. And what is often mis-understood in countries without the infrastructure is that it benefits all cyclists. That is why those Belgians come across the border into Zeeland to do their training. It's a lot more pleasant to ride any type of bike on this side of the border. Well, how do *you* explain all those stories off people who 'fell on their heads' and 'cracked their helmets' (okay, Dr Paul has shown us that even if you fall sideways the width of the helmet ensures it making contact with the ground) falling from a bike? Why do people in America fall all the time? I've ridden an oma or a citybike for nearly forty years, on ice and snow as well as nice clean tarmac, and I've fallen *twice*. In my whole life. Once when I was twelve and I did something stupid on the bicyclepath and I got clipped by a passing motorcyclist (I fell and scaped my arm and bruised my hip - my head went nowhere near the pavement - and I never did that particularly stupid thing again) and once in midwinter, slipping on an unseen patch of ice when turning a corner. I fell on my bum again. Because that's what happens if you slip, or get jarred enough to lose balance; you fall on your bum and side, and not on your head. and land head first. A salto mortale? That's pretty amazing, really. The only way anybody could fall that way is if the bicycle would somehow *throw* its rider, like a bucking horse (although the fall from a horse is from twice the hight, and no American cowboy would deign to wear a helmet), so I got to think on the American obsession with the weight of their bikes. Now, I've ridden all kinds of Dutch bicycles, and they're all stable, but the Batavus freight, for instance, or the bakfiets are even more stable than most, and this is due to their low point of gravity. This is engineered thusly because these bikes need to carry a lot of weight and so need to be stable. There might be nothing wrong with racing bikes, but they are built for one purpose only, and that is not stability or lumping freight about, but to be *fast*. They're racing bikes, not commuting bikes or freight bikes. Their point of gravity must be significantly higher, and I thought this a good explanation of why these helmetzealots who claim to have broken several helmets because of tumbles of their bikes would be thrown off their bikes, flip through the air and land on top of their heads. If you say that lightweight racing bikes do not behave different than solid Dutch bikes, I will take your word for it, of course, having never ridden a racing bike, but if not the bike, what makes the American helmetzealots so much more... acrobatic than us Dutch? Marion: Racing bikes are different to ride than an omafiets, and they've not much use for many utility purposes, but they're not really unstable or dangerous. The rest of it is hyperbole from people with a helmet-pushing agenda. kfg is quite right about this. The chance of falling from a bike and hurting oneself is much what it always was: very small indeed. Riding in the US is significantly more dangerous (see the note at the bottom) than riding here, but that's primarily down to their riding on busy roads and being hit by cars. The cycle paths of the Netherlands are demonstrably much safer than roads in the US, Australia and other countries where helmet hysteria is common, but even there the risk of death from cycling isn't actually that large. I agree that no matter what style of bicycle we're discussing, the risk of falling off is low and the risk of injury even lower. The greatest threat to a cyclist from an injury perspective comes from motor vehicles and no styrofoam helmet is going to save you there. With respect to the difference between Dutch-style bikes (omafiets - I like that word) & racing bicycles, I think the key is that racing bicycles are trickier to ride than omafiets in *inexperienced* hands. One odd thing I've noticed here in Australia is that people who see themselves as cyclists only really ever cycle once a week (at most) and as a result, I would argue, are not terribly good at it. They are inexperienced. It would be like putting a learner driver behind the wheel of a ferrari instead of a golf! If they cycled any style of bicycle regularly they would probably be much safer than riding occasionally. The omafiets are easier for even a novice to ride. I notice this when letting friends try my Gazelle - it is usually the first thing they comment on without priming. Rather than improving the actual skill of cycling, most weekend cyclists here are far more interested in what outfit they're wearing and how fast they go. I wonder if they could stop shorter than me if they needed to? I doubt it. Just the other day I witnessed a fifty-something gentleman fall over at the traffic lights as they turned green while he failed to clip his shoes into his pedals - he was almost run over. Novice cyclists shouldn't have this sort of dangerous distraction on the roads. I used to race bicycles 10 years ago and can see the lure of it - but I've never been happier riding around my city since I've owned my omafiet! Paul: You do have a point about experience, and that clipped in feet are really not necessary for occasional cyclists - even if they're riding something which looks like a racing bike. I think Marion has a point about the differing geometry of the bikes effecting one's ability to do a header. My road bike has a 1 meter wheel base. I can definitely lift the rear wheel off the ground by excessive breaking. My cargo bike on the other hand has a 1.5 meter wheel base and weighs more than twice as much even unloaded. No matter how fast I pedal and how hard I break I have never gotten the back wheel to lift off the ground. I couldn't do a header on that bike if I tried. A city bike probably has a wheel base somewhere in between a road bike and a cargo bike. At 19.5kg, the one Batavus city bike I checked weighs almost as much as my cargo bike. I can see where it would be more flip resistant than a road bike. My roadie friends have told me stories of sticks caught in the front fork of a road bike flipping the rider over the bars so perhaps they have something to be concerned about. This may be the cost of using a bike optimized for things other than getting around town.